There are many juice machines on the market to choose from. As tempting as it might be to buy the most inexpensive juicer, this isn't always the best juicer to buy. Buying a cheap juice extractor will save you about $200-$300 or more on the cost of the machine, but the lower quality of the motor means lower quality juice from it and less juice extracted. My first juicer was a $70.00 Juiceman brand. I loved the juice I made from it, I juiced with it almost very day. However I had it less than a year when it stopped working. The company was easy to to work with and promptly sent me a shipping label to send it back to them, which I did and they sent me a new machine. That one worked fine too, for about a year then its motor also broke. I didn't want to ship the second extractor back to them so I just lived without juicing for a couple years. This is why I would say the best juicer to buy is one that costs a bit more money, at least $150-$200.00. If you have much knowledge about juice extractors, you know there are two basic methods used for juice extraction. The centrifugal method spins the produce between 3000-13,000 RPMs through a grinder or shredder. This fast speed does juice produce quickly, which saves time, but the quality of the juice is much lower because the heat from the fast speed kills enzymes and vitamins, and more air is forced into the juice causing oxidation. The masticating method may use one auger or two augers and may add a second step of using a hydraulic press to get the most juice from the pulp. This method goes slower, the blades rotate at 80-110 RPMs. This is much slower than the centrifugal method, allowing the enzymes and vitamins to come out in tact. Masticating juicers are often more expensive than most centrifugal juicers, though usually not by a significant amount and the quality as well as the amount of juice produced makes it worth the extra money. Dr. Gerson would not recommend centrifugal juicers for his cancer therapy patients. He found they did not have health improvement when using cenrifugal juicers, because they didn't extract enough nutrients. When they changed to the dual step masticating machine they saw rapid improvement. If you have never had experience with making your own juice before, you might find after a few times that you just don't like juicing either because of the taste (it didn't take me long to acquire a liking for the healthy taste of fresh juice.) or because it takes more time than you want to spend, especially for the clean-up. Since juice machines are notorious for needing some time to thoroughly clean after each use, it's important to look for one that has a selling point of being quick and easy to clean. A cheap juicer is not recommended for someone who is serious about juicing, but if you just want to test the waters of home juicing (I believe you will find out it's worth it! ), to find out if it is something you want to do regularly, then this Black and Decker juicer might just be the best juicer for you to buy. I wouldn't normally suggest a juicer under $100.00, but this one has great reviews. One lady says she has been making fresh juice every day for three years with it. That is great for a juice machine under $50.00. It is also said to be easy to clean. Since it is a centrifugal juicer it wont have nearly as many nutrients as a masticating one will. 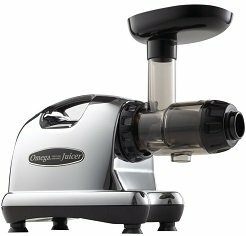 Omega juice extractors are some of the best juicers to buy. They are high quality and Omega has one of the longest warranty periods. Both of the extractors on the right have a 15 year warranty. They are both single auger, dual step juicers, the type that makes the highest quality and quantity juice. The Nc900HDC on top is is built identical to the J8006 below except that is had a larger feed shute, allowing you to put larger pieces of fruit and vegetables in it. Because of this feature it is a little more expensive.